College students generally don't need any help packing pizzas into their pieholes. But now students at Xavier University will get to smash slices without even having to interact with another human, thanks to the newest pizza revolution: the Pizza ATM. Just like a regular ATM, but with pizza instead of a sad lack of funds in your account, the Pizza ATM is set to debut at Hoff Dining Hall at Xavier University in September -- the first of its kind in the United States, according to WCPO. French manufacturer Paline has seen Pizza ATM success already in Europe, but thus far hasn't broken into the pizza-crazy American market. And for Xavier, the machine economizes the process of making hundreds of artisan pizzas per day. "We were looking for a way to solve this problem of having a late-night pizza option on campus," Assistant Vice President Jude Kiah told the Cincinnati Enquirer. "And this meets our students where they’re at, in their residence hall." Students will be able to punch in their preferred pizza topping, and the pre-prepared pie will ascend from a refrigerator unit to cook in about 3 minutes before dropping into a box. Each piping-hot 12-inch medium pizza costs $9. And a university spokesman gave an even more molten quote to the Enquirer about it. "I’ll tell you what," the university spokesman said. "The pizza vending machine is hot." Hot, yeah, but not nearly as smoldering as that quote. 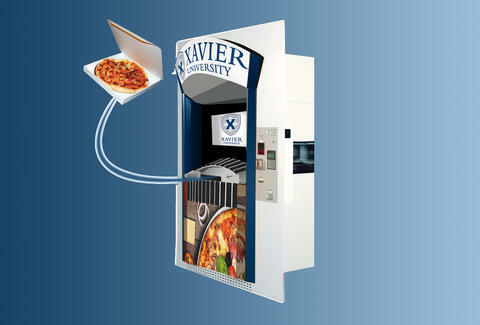 Xavier will be the exclusive distributor of Pizza ATMs in the US. But you can only imagine automated pizza machines will one day rule all of our dollars and all of our meals. This is the future of pizza. Ryan Craggs is Thrillist's Senior News Editor. He prefers his pizza by the slice and dripping with pepperoni grease. Follow him @ryanrcraggs.